Chilean director Pablo Larraín returns with his latest film, the highly acclaimed No (2012), to Splendid Cinema on 9 June. Set in the late 1980s, the film examines the important moment in Chilean history after dictator Gen. Augusto Pinochet authorises a national plebiscite allowing people to vote whether they want him to continue his presidency for 8 more years, or not. Fifteen minutes of television airtime is given for those supporting Pinochet’s regime as well as those who oppose to it. No is a story about a young advertising executive René Saavedra (played by Gael García Bernal in a career defining role), who is hired to run the ”No” campaign. By taking the job René is forced to confront his boss Lucho (Alberto Castro), who organises and directs the ”Yes” campaign. Being constantly criticised for his decision to work for the opposition, and experiencing threats against the safety of his family, René does not give up. No highlights possibly the most incredible advertising campaign in history; to keep a blood thirsty dictator or to embrace democracy. No was nominated for the Oscar in the Best Foreign Language Film category. The uplifting and intelligent take on this significant moment in Chilean history, the fall of their totalitarian regime, is the absolute must see! And with our screening of No, Splendid Cinema concludes our 2012/13 seasons. We’ll be back in September highlighting the best in International Cinema. For more information on any of the independent cinema’s screenings, please contact Mikel Koven at splendidcinema@live.co.uk, or follow the blog splendidcinema.wordpress.com. 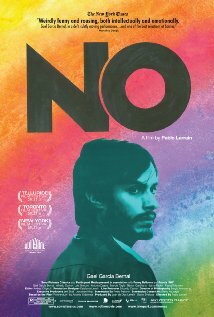 No (Chile, 2012, Pablo Larraín) 118 min. 15 Cert.